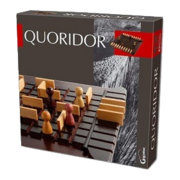 Home » Games » Quoridor: How to play? A game by Mirko Marchesi published by Gigamic. Board Game Arena would like to thank Gigamic for making it possible to have this game here. Quoridor is an abstract board game for 2 or 4 players. Players move their pawns to reach the opposite side before their opponents; however, the defining quality is that players can place walls on the board that block all pawns, thus forcing pawns to navigate their way around the walls. The board is 9x9 by size. Each player has one pawn, placed in the middle of their respective side. There are 20 walls, distributed equally to all players (10 each for two or 5 each for four). A player can move a pawn to an adjacent square in the four orthogonal directions (front, back, or sideways). The pawn may not cross past a wall. The pawn may never occupy the same square as an opponent's pawn; if an opponent pawn is adjacent, the player can jump over the opponent's pawn. If there is no wall, no board edge, and no other pawn behind the opponent's pawn, the jump must be straight (the player's pawn moves two squares in that direction). Otherwise, the jump must be diagonal (the player moves to the opponent, then moves sideways). Jumping is never mandatory. There are some walls in a player's inventory. Each wall are two squares long. A player may place a wall inside the board, between the squares. The wall may not jut out of the board, and it must be aligned with the grid, so that it blocks two pairs of adjacent squares. A wall blocks all pawns' movements; no pawn can jump over a wall. However, there must always be at least one path for each pawn to reach the opposite side; a wall may not be placed to completely isolate a pawn from their destination side. Note that walls are limited; if a player uses up all their walls, they can no longer place walls. If a player's pawn reaches any one of the nine squares on its destination side, opposite of the starting side, the player wins.